I just finished reading an article about all kinds of food that we should be making ourselves because they are easy to make and far more nutritious than the store-bought versions. One of the foods they wrote about was hummus. A quick look at a store label listed artificial colors, MSG, and various other artificial ingredients and preservatives. This is a food product that I regularly use that I really needed to clean up. For those of you not familiar with Hummus……….don’t be shy, you can admit it……….Hummus is a traditional Middle Eastern spread made primarily from chick peas. Chick peas are a great source of fiber and protein which is what got me into checking out hummus. I’ve come to discover that my stomach prefers a diet light in meat. I am not a vegetarian, but for the most part, you will only see meat on my plate for one meal per day at the most. My body just seems to perform at its best when it doesn’t have to digest meat all day. I also have noticed that my brain doesn’t seem to work very well without protein, especially since I’ve kicked caffeine out of my life. You’ve got your coffee…………I’ve got my protein. Hummus really fills my need for protein a lot of days. It is perfect as an ingredient in a wrap or as a dip with veggies or pita chips. I hope you enjoy this super easy recipe. I really don’t know what took me so long to try to make my own hummus. It is so easy and more delicious than anything I’ve ever bought at the store. I used a recipe I found at About.com . I have seen lots of other hummus recipes, but what I love about this one is its simplicity. After all, that’s what Juggling Real Food and Real Life is all about. Special note………when making this, don’t forget to put the tahini in and then complain about it being too runny. Tahini is a thickener. It looks a lot like peanut butter. And yes……I’ve forgotten it more times than I can count. It usually takes me a day to figure out that I forgot the tahini………again. When I do forget the tahini and it is kind of on the runny side, it is best to use as dip. Hey! Real Food can be expensive if you make mistakes and throw it out. Don’t toss it, it still tastes good. But, to keep your outfit nice and pretty it may not be a good idea to eat in a wrap. Wow! What a mess that makes. Again…….not that I would know. 1½ tablespoons tahini (tahini can be found in your regular grocery store. It comes in a tall jar. It is ground sesame seeds so it similar in consistency to natural peanut butter). Drain beans and set aside liquid to use later. (if you drain into the sink and don't save the liquid as I did the first time, simply substitute water). 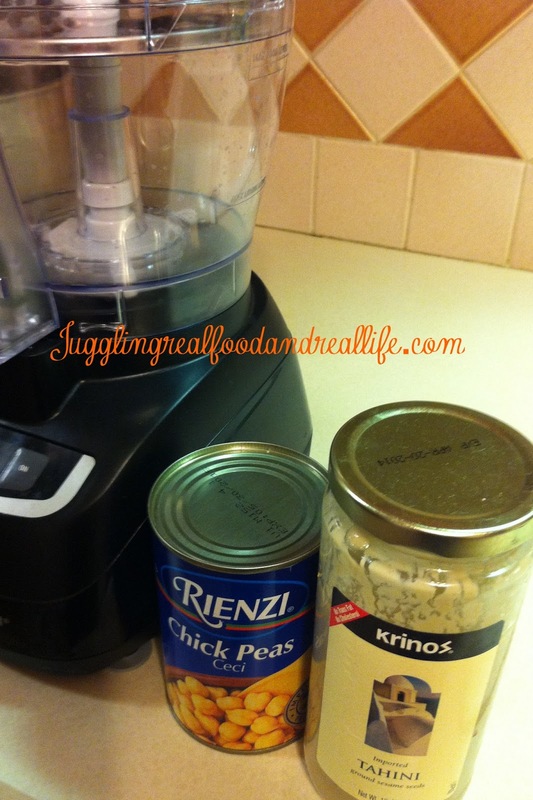 Combine beans, lemon juice, tahini, garlic, salt and olive oil in a food processor. (a blender can also be used). Add additional liquid and mix for about a minute or so. For serving......put hummus in pretty dish and using a spoon put a well into the middle. Pour an additional tablespoon of olive oil into the well. Garnish with fresh herbs. Now it’s your turn. Tell me your hummus stories. Do you like hummus? Is it new to you? Do you have a favorite way to flavor hummus? Do your kids eat hummus? How about your husband, will he eat it? You might also me interested in this recipe for horseradish hummus. Sure is Sam! I often serve it at parties and it is always a hit. you don't realize how much junk is in "healthy" store-bought items! i love making my own hummus, its easy as buying it in the store too 🙂 i never tried putting the olive oil in the middle when serving..doing that the next time i make it! It is really easy Amanda. The key is to keep the ingredients on hand. Then it is easier than running to the store to buy hummus. Let me know what you think of the olive oil. Cumin, smokey paprika and fresh parsley. That's what I add to the above recipe. My new favorite spice is cumin. I will have to give it a try soon. I just bookmarked this for one of my Christmas treats. My husband and I love hummus so much. thanks a lot for sharing. I hope you enjoyed the hummus. I served it at my Christmas Eve party and it's always a hit. Last year my husband and I traveled to Israel. One evening we were eating dinner and a lady who was sitting on the other side of my husband said to him, "how's the hummus?" He said, "Oh, I don't eat hummus". She glanced at the large bowl of half eaten hummus in front of him. I said to him, "honey, that's hummus that you're eating". The look on his face was priceless and we all started laughing together. He had just always believed that he wouldn't like it and didn't realize that was exactly what he was eating in Israel. Now every time I go to a store that has "good" hummus, he REQUESTS that I bring some home 🙂 I'm going to give your recipe a try….thanks for sharing. What a great story! My husband sounds like your husband. He'll eat healthy, just don't let him know it's healthy. The great part about this recipe is that it can be made simply as written or changed up with added ingredients. I hope he likes it! I can't wait to make my own hummus! Thanks for the recipe! Seems so simple, yet sounds so good! It really is simple and delicious. It's a great go-to for so many reasons. I love it as a dip for veggies and pitas. I also love it a little thicker to be used in wraps. So good!